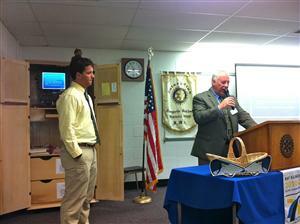 Michael "Brody" Leon is the Chagrin Valley Rotary CAP Awardee this year. This award goes approximately annually to a non-Rotarian who demonstrates the "service above self" motto of Rotary. Brody, a 2011 Kenston High School graduate, is unusual in capturing this award this year. Previous winners have been much older adults with years of community and professional experience. The selection of Brody reflects the tremendous service he has given to the community even as a student. We are so fortunate to have him as part of our community and wish him the best of luck in Colorado.